Embryo transfer: Why is one better than two? Home / About us / Latest news / Embryo transfer: Why is one better than two? The natural incidence of spontaneous multiple pregnancies is 1 in every 85-90 births. However, there has been an increase in multiple pregnancies in recent years in the developed countries, largely due to assisted reproduction treatments. Most people believe that it is a risk that must be taken because the greater the number of embryos transferred, the greater the possibility of achieving pregnancy, although this is not always the case. Initially, the mother usually presents anaemia or increased blood pressure, which may lead to pre-eclampsia, a disease that compromises her health. There is also a greater risk of malformations, miscarriages and foetal demise, and the premature birth rate is very high. Similarly, there is a higher risk of placental insufficiency, retarded foetal growth and postpartum bleeding, as well as the indication for caesarean section. 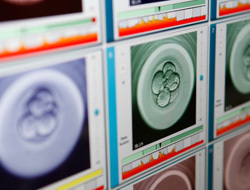 For this reason, many countries have taken different measures, such as the application of milder ovarian stimulation treatments and limiting the number of embryos transferred in IVF/ICSI cycles, following the recommendations of the scientific societies, although in oocyte donation treatments the problem has been less debated. The good news is that egg donors are young women in whom generally speaking the likelihood of the embryo being implanted immediately in the recipients and for the pregnancy to progress are very high. Moreover, “in egg donation treatments, pregnancy rates with the transfer of a single embryo are already practically the same as with two embryos”, explains Dr. Elisabet Clua, head of the Dexeus Mujer Egg Donation Programme.